My sister is a huge fan of roasted red pepper hummus so she was one inspiration behind me creating my own version at home. The other inspiration was my fancy new blender that I just knew would create the smoothest, creamiest hummus I’ve ever made. And I was right. This was the smoothest, creamiest hummus that has ever come from my kitchen. I’ve been without a regular blender for over a year now. The last one I owned, an overpriced and under-performing blender, broke as soon as the warranty expired. I just wasn’t in a big rush to run out and replace it with another piece of junk. I’ve never really been a huge fan of blenders because I have never owned one that worked really well. Sure, they all claim to crush ice, but they never really do. I knew that there was another class of blenders out there that could do all sorts of wonderful things, but they have always been way out of my budget. So, I’ve made do with my food processor and immersion blender and for the most part have been perfectly happy. But I’ve always been secretly envious of those lucky Vita-Mix owners. And yes, I have been researching high-powered blenders for the past year, silently wishing to have one one of these mystical machines taking up more of my precious counter space. And then it happened. I innocently went on a trip to Costco with my sister and brother-in-law. I was there with good intentions—my main mission was to pick up some new books and dvds to send to Justin in Iraq. I had just placed a dvd set of 24: Season 7 in the cart when I heard the sound: a blender! I couldn’t help myself, I started walking towards the sound and the gathering crowd. On the table was one of the two blenders I had been dreaming of for the past year. It was a Blendtec, and I was instantly hooked. I stood there wide-eyed as the showman created something with the texture of ice cream out of nothing more than a handful of strawberries and some ice cubes. I eagerly tasted the samples of the ‘whole fruit’ juice he made after throwing a mixture of fruits, peel and all, into the miraculous machine. Penny and Robert eventually found me and started laughing uncontrollably when they saw me standing there, transfixed. I know, I know. It was like being sucked into a real-life infomercial. Except this was a product that I knew. It was a product that I had researched. And that’s how they got me. It didn’t help that Penny and Robert were standing there urging me to do it. One of my brother-in-law’s favorite pastimes is to take me to Costco and see how much money he can get me to spend on things I don’t really need. For him, this was the mother lode! So you’ve already figured out that I bought it, right? It’s been over a month now and I don’t regret it one bit. This blender is amazing. It will pulverize anything I put in there, wet or dry. I can grind grains into flour, I can grind nuts and spices, even tiny amounts. I can make velvety smooth sauces. And of course, it makes excellent hummus. I’m not gonna lie, these things are expensive and plenty of you will think I’m crazy. But for me, it was worth it. My name is Nicole and I am in love with my blender. Leftover hummus can be stored, covered, in the refrigerator for a few days. I've also heard that it freezes well, but we never have any leftovers! * I know that roasted red peppers are available in jars at the grocery store, but they are so easy (and in most cases cheaper) to roast at home. I think fresh roasted peppers taste better, but you can use whichever you prefer. Here are some instructions for roasting red peppers. And did you know that you can freeze roasted peppers? Why not roast a bunch at once and then freeze the leftovers? Here are instructions for freezing roasted peppers. Ooooh, this looks SO yummy! I definitely have to make it!! I'm so jealous!! 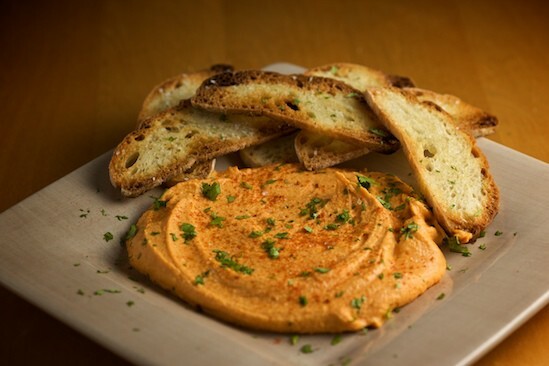 I make roasted red pepper hummus all the time, but mine never comes out as perfectly creamy as yours looks. I usually cook my own garbanzos. I do a big batch of garbanzos and a batch of roasted peppers once a week and use them little by little to make hummus - it's a great last minute dish for unexpected visitors. I live in Venezuela and some times we have people drop by almost every night of the week. I'm still in the phase you just graduated from - dependent on a processor and immersion blender. Congratulations!! My husband and I love Hummus, I enjoyed your blender story. I made some quick hummus for summer school and found my stick blender worked great! I used a vintage mixer bowl (Hamilton Beach) it's narrow and deep and I loved the control my immersion blender gave me. Not that it was as smooth and creamy as yours! The clean up was so quick and easy.I like the idea of roasting your own red peppers, I bet that was so good! Ok, if u tell me you can make super smooth homemade Nutella with this fancy schmancy blender of yours, I will be super impressed. Was the Costco price the same as Amazon? I haven't seen it, but it must be somethin' special! I'm so happy you love it! And I'd love some of that red pepper hummus right now too. I love red pepper hummus and have been making it for years with an almost exact recipe to yours, minus the hot sauce and honey. Sounds great.I am most intrigued regarding the blender as I keep debating over whether to get the Blendtec of the Vita-Mix. All the debating has left me without either one. I made a killer sunflower seed pesto dip in someone else's Vitamix and I have been pining for one ever since. I ought to just bite the (BIG) bullet and buy one -- daily hummus, dips, sauces. Oooh, getting hungry... thanks for the great post. ok, i am SO jealous of that blender. I love hummus! This one looks really great. Just recently, I recently prepared a hummus recipe from Gourmet magazine that was popular in Israel. Very nice. I posted it on my blog, if you enjoy hummus you may want to check it out.Love your blog! A) This looks delicious. Must make. and B) This photo is particularly beautiful - love the contrast of the orange, green and red.Thanks for another great recipe! I have some red peppers maturing in the garden. This recipe sounds so delicious and would love to make it for my next big bash I am throwing in a week BUT I do not have a good blender. In fact, I hate my blender. Not sure I am ready to spend that kind of money yet....but maybe....is the Costco price better?Thanks for the great post! This looks and reads so mouthwatering! Unfortunately I don't have any red peppers at home and it's Sunday. So this will have to wait until tomorrow. I've never had hummus with red peppers but it sounds like a future favorite. The most common recipe in Germany is hummus with chickpeas which I love, too. How can I stop drooling now? Thanks for your great recipes and entertaining writing, we love your blog! *grin* I got my first ever blender a few weeks ago, and I do believe I am in love as well. I had to put my foot down and resist the urge to make milkshakes everyday, but I can still make killer soups. I love hummus, but I've never made it at home... looks like the blender is going to be taken out for a new spin very shortly! Great post for both the hummus recipe (have never tried it with red pepper) and for the blender love story! Thanks for the reference I may consider one myself - you are right the department store 'blenders' never really work and never last very long. I got my first Vitamix in 1948. Papa Bernard (the founder) was selling it on the tiny television screen. It was metal and I've had two since then and wouldn't be without one. Got one as a house gift for my daughter and one for my granddaughter. Here is the recipe for my daily breakfast smoothie. 8 ounces Very Vanilla Silk; 6 good size frozen strawberries; good handful of frozen blueberries; quarter of a cup of McCann's quick cooking oats; 1 Weetabix bar; optional tablespoon of Flaxseed. Give it a whirr on high for a few minutes until nice and smooth. Delicious. This recipe sounds Delicious! One question though - What is sriracha? Where do I find/buy it? and how is it used prepared for recipes? Okay I guess that's 3 questions but all centered on the same ingredient. (Am I really the only one who doesn't know about what this sriracha is???!!!) Thanks for the help. Hello !I have been following Pinch my Salt for quite some time and I just love all your recipes.... Yumm .... I just had a doubt, do the garbanzo beans need to be boiled ? Ciao ! I'm envying your super duper blender ! But for the moment I'll copy this wonderful hummus !! I just prepared some pepper for,,,it ! Wow - I have a blendtec at home and use it to do soooooooo many things - this looks gorgeous and I'm going to try it out soon! I've blogged many times with recipes that use my blendtec - love it all except the noise. Found out a way to get over that - Now I use my blendtec with my ipod headphones on! Hey...what size can of garbanzo beans? Thanks! Wow this is really great! My family and I actually sell roasted red bell pepper sauce. It's so tasty. If you all want you can check us out at www.festinfoods.com. We have many other types of sauces too, like a yummy blackberry chipotle sauce. Yum! Just got the Vitamix for Xmas and this was first hummus we tried. It is fantastic! Excellent recipe! Loved it! This was a hit with my whole family including my 1 year old. This is now going to be a regular feature in our snack repertoire. Thanks! This. Is. Amazing. I made it with what I had on hand, so instead of red onion I used a dash of dehydrated onion flakes, 2 pieces of bottled roasted red peppers, 2 tablespoons tahini, 1 tablespoon bottled lemon juice, and added some paprika (accidentally put a LOT in). I love the sweet, smooth, and spiciness. Definitely the best flavored hummus I have ever tasted. When I saw the recipe, I just knew I had to try it. I love the post about the blender, I have a (normal) blender that works like most other blenders. I'm afraid to do ice in case I break it. I would love a Vita-Mix or BlendTec. That being said, I love hummus, any kind, especially if it involves roasted red peppers. Thanks for the recipe.